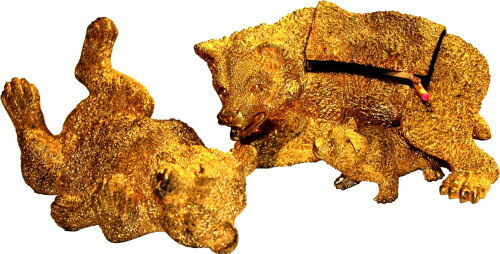 The bear family to be exposed on the table made of green malachite Bronze covered with gold. What kind of articles are presented in this Collection? In Biedermeier times there started industrial production of goods which penetrated practically into every household both in Germany and also, to some extent, in Great Britain, France and Russia reflecting the spirit of those times. The value and exterior of these objects of culture and art produced between 1835 and 1935 were finally determined by the wellbeing and preferences of their owners. Making use of the variety of materials producers aspired to meet the demands of customers from all social strata. 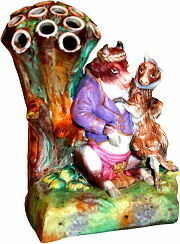 The production which was initiated by Prussian royal cast iron manufactures in Berlin (Berliner Eisen) was later followed by porcelain manufactures: Meissen; Schumann, Berlin; Carl Tielsch, Fürstenberg etc. The initiative was seized by enterprises producing majolica (Bernhard Bloch), by craftsmen in pottery (Maresch), carving and making silverware, as well as such craftsmasters who are well-known for their wonderful things made out of iron as E.G. Zimmermann, Hanau; Josef Glanz, Vienna and many others. 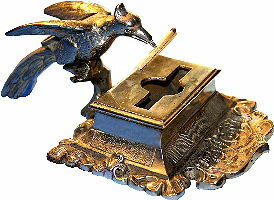 Most famous authors of that time were inspired by the greatest invention of Biedermeier epoch, a match, while this very small and plain object had dramatically changed the daily routine life of every single person. The significance of this invention was made more prominent by means of producing unusual or surprising and therefore deserving attention forms of its presentation which sometimes can be valued as real masterpieces. There is not a single museum in the world or a private collection which have ever presented these objects of culture and old times in the whole variety of styles, forms or materials showing remarkable splashes of human fantasy and creativeness which, in turn, enlightens a very important period in the history of our culture. Who is nowadays well aware of how much effort was once put into just getting light into the house, making fire in the oven or the fireplace, lighting a cigar, a candle or a chandelier, striking a sparkle out of steel? No other technique in the past two hundred years was connected with so many inventions and patents as just the controlled ignition. This cultural segment has practically been cut out of history, culture and art, probably, because of the fact that it has automatically been reduced in our imagination to the simplicity of the latest consumer goods involved in the process, i.e., matches and match-boxes, which are normally used by a consumer, thrown away and ignored. 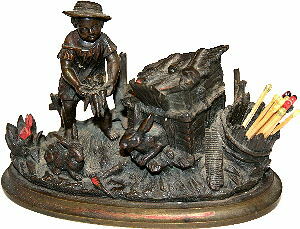 Thus the whole subject concerning the techniques of making and preserving fire has also been put in the background of history and culture as unimportant and not worth attention. This Collection and the enormous work connected with it are aimed at proving the opposite. 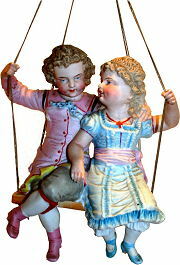 Match holders were produced for the parlour as well as for the study, sleeping room and, without doubt, for the kitchen in the form of separate figures or figural compositions, both for the table, wall and pocket, for the household and travelling. The production involved not only home market but also, to some extent, foreign markets, mainly, the USA and Great Britain. Those times are considered to be the most successful and prosperous for a number of famous craftsmasters, among them Zimmermann in Hanau, Glanz in Vienna, Kasli in Russia. They managed to achieve the real highlight in their creative work with such a high quality of their products which was not possible in the years to follow and especially after 1900. Exhibits presented in this Collection, which contains about 2500 articles - figural, non-figural, or organised in compositions - have been collected for more than thirty years from the remote corners of the world where they had been exported to or happened to be brought to by their owners. These numerous cultural and historical values, the existing witnesses of the brief period in the history of human civilisation could have been destroyed, burnt or lost for good in Germany or other European countries in the fires of World War II. Fortunately, they have been preserved in their present state and even returned into the country of their origin from the USA, Canada, Australia and South America. As the aim of the author was to fill in a lot of gaps still existing in our knowledge about different ways of making and preserving fire in the history of human civilisation, this Collection will be interesting not only for the collectors but for every person who is anxious to learn more about our history and culture. It is to a great extent the result of the intensive and enthusiastic research work on the subject which took 30 years, so that the whole Collection in its present state contains numerous old rare exhibits provided with original interpretations, new unknown points of view, versions and discoveries. 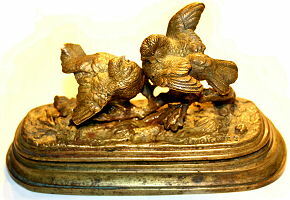 Match holder for the table. Unmarked. 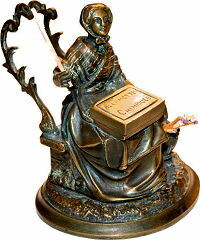 c. 1880, Bronze. Matchsafe France, enamel pictures inside and outside. 1880. 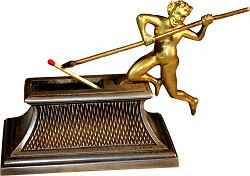 Match holder for the table in the form of a sedan. Germany. c. 1870. Silver. Match holder for the table. Julien Moigniez, France. 1870. Bronze. Box for matches made of china. Vienna. State manufacture. c. 1860. Match holder for separate matches. Iron. France. 1880. Woman with 2 baskets. Berlin iron 1830. 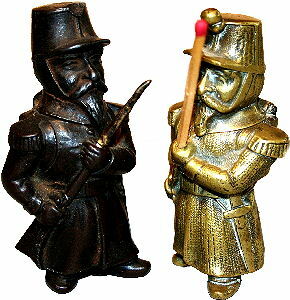 French soliers, J.Glanz, Wien, iron and bronce 1860. Automatic machine for the table. Wood. Germany. c. 1870. 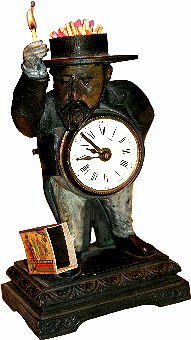 Automatic clock to light a match. Germany 1880. 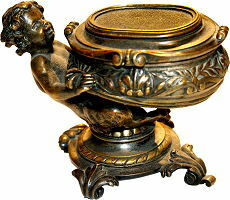 Inkwell with matchholder, Bronce, 1880. 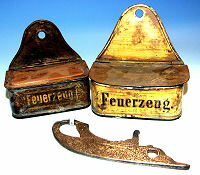 Collection of old match-boxes from Germany and Austria (1840 – 1945). Approx. 1500 items. 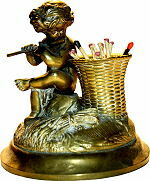 Collection of original old drawings and scripts concerning the production, advertising and selling of matches. 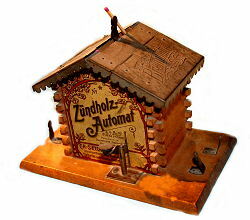 Collection of old automatic machines. Extensive library of rare and unique books and periodicals on the subject, beginning with 1840. Collection of old hand-made match labels beginning with 1840. Collection of shares, bills and other original documents from the first manufactures. The range and significance of the material presented in this Collection which consists to 80% of rare and unique objects of culture and art and embraces a variety of styles, - Biedermeier – Classicism – Gründerzeit – Art Nouveau – Art Deco, – speak for its existence as a museum which could be located in a suitable building, probably even integrated into appropriate premises, easily accessible for the large public, for example, in a place or a small town where people often go for holidays, winter or summer sports, or both. Existing Museums of Matches in Sweden, Poland and Czech Republic unfortunately have only a few old match-boxes to exhibit. 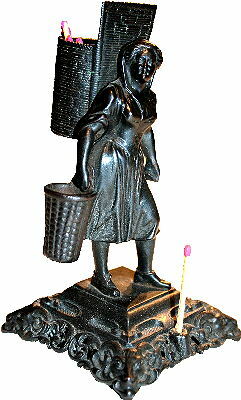 A wide variety of different kinds and forms of match holders with their cultural and historical background has never been exhibited in any museum in the world. With this Collection you have a real chance to create yourself a living monument by establishing the only of its kind MUSEUM OF CULTURE AND ART full of amazing articles of historical and cultural significance! The material in every detail can be found in: Wolf-Rüdiger Reinhardt. Europäische Streichholzbehälter und ihre Verwandten. (forthcoming). It was also the subject of numerous reviews in newspapers, journals and magazines, as well as in radio and TV programs both in Germany and abroad. Part of the Collection was exhibited in a State Museum in Germany. 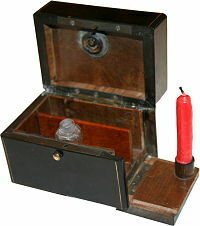 Instantaneous light box with a container for phosphorus. 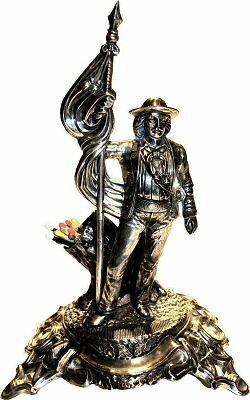 Bronce. France. c. 1800. Instantaneous light box. France. c. 1820. Tinder bags for the wall and fire-steel. c. 1800. Tinder bags in the form of pockets Germany. c. 1820. 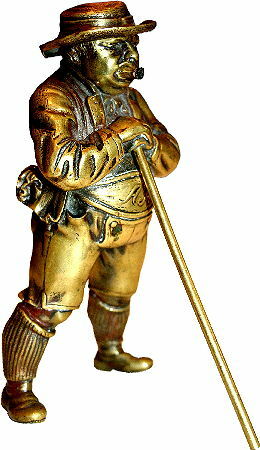 Figural taper made of bronze (Zigarrenmann). 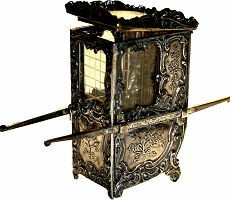 Designed to light cigars and used as a piece of equipment in cigar shops. 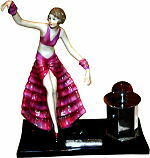 The figure used to contain kerosine.Its cigar is provided with a wick. Germany. c. 1880. Kids on the swings. To be hung under petroleum lamps for used matches. 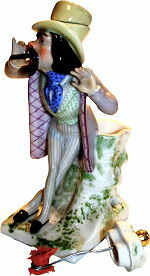 The container is attached to the back of the figure. Germany. C. 1850. Striker. The container was filled with benzine. A special stick made of steel and equipped with a wick at the bottom was first dipped into benzine and then set on fire by means of striking against flint.Germany. c. 1930. Figural taper. 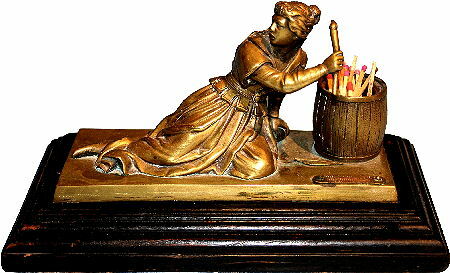 The figure used to contain kerosine, and the fire was kept burning. A stick made of wire with a shred of textile at the bottom was pulled out of the figure. 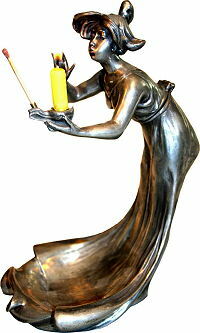 This burning taper was used presumably to light candles in candlesticks, chandeliers etc. Germany. ?P?, Berlin. c. 1840. Taper holder (tapers were inserted into the holes on the top of the figure). Germany c. 1850. Questions concerning the price will be appreciated in a written form.